The Invergordon Archive - Invergordon Football Team 197? 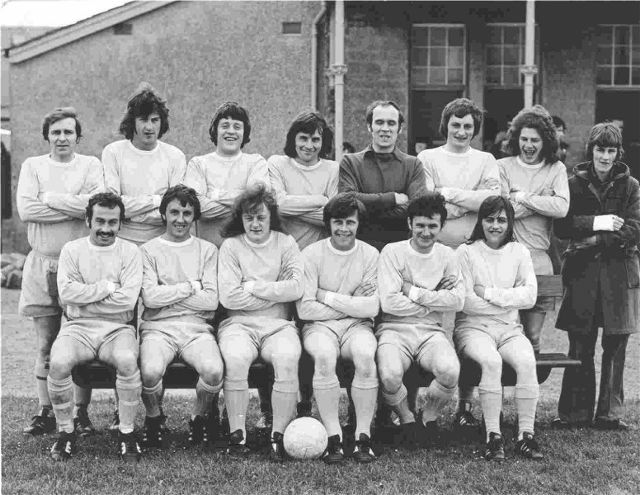 Back row (left to right): Sandy Lyle, Gordon Mackay, Edmund Stainke, Michael Laird, Willie Macdonald, Angus Burnett, John Oliver, Fraser Moir. Front row: Richard Hart, Davy John, Tommy Morrison, Sandy Adam, Sammy McLymont, ?. Hi George. The Stainke is Alan, not Edmund - Eddie is older and at the risk of getting a slagging from him was nowhere as good as Alan. Don't know if you are aware - Harty's son is playing for Inverness Caley in the Premier League. I think this photo was taken on a trip to Orkney. There are a few guest players in the side. It is either the game against an Orkney select or Kirkwall Rovers. Invergordon drew 2-2 with the select and beat Kirkwall 4-0. This was definitely taken in Kirkwall, Orkney. The building to the rear of the group is the Bignold Park Pavilion/Changing rooms at Bignold Park, Kirkwall. This photo was taken either May 23 or May 24 1975. The player front right is Russel Marshall. I have a picture in my collection which will be going on my e-bay site tomorrow. It's of the Invergordon football team back in 1917. You will be able to view it on Postcard Invergordon football team Scotland. My selling name is derwenthb; I am from Cornwall.